Garden State Parkway South to exit 130 bearing right onto Route 1 South. Follow to Interstate 287 North. Follow to the Route 27 South-New Brunswick exit. Bear right onto Route 27 South. Pines Manor is a half mile on the right. Interstate 287 South and follow to the Metuchen-New Durham exit. Make a left off exit onto New Durham Rd. Cross over bridge, staying to your right. at the first light, make a right onto Bridge St. Follow to the next traffic light and make a right onto Route 27 South. Pines Manor is a half mile on the right. New Jersey Turnpike South to Exit 10. Follow signs to 287 North. Follow to the Route 27 South-New Brunswick exit. Bear right onto Route 27 South. Pines Manor is a half mile on the right. Route 1 South and follow to Interstate 287 North. Follow to the Route 27 South-New Brunswick Exit. Bear right onto Route 27 South. Pines Manor is a half mile on the right. Take 440 South over the Outerbridge Crossing, Route 440 South becomes Interstate 287 North. Follow to the Route 27 South-New Brunswick exit. Bear right onto Route 27 South. Pines Manor is a half mile on the right. Take the George Washington Bridge or the Holland or the Lincoln Tunnel to NJ Turnpike South. Follow the Turnpike to exit 10. Follow signs to Interstate 287 North. Follow about 2 miles to the Route 27 South-New Brunswick exit. Bear right onto Route 27 South. Pines Manor is a half mile on the right. Garden State Parkway North to exit 127. Take Interstate 287 North and follow to the Route 27 South-New Brunswick exit. Bear right onto Route 27 South. Pines Manor is a half mile on the right. Interstate 287 North and follow the 27 South-New Brunswick exit. Bear right onto Route 27 South. Pines Manor is a half mile on the right. Route 1 North to the Plainfield Ave jug handle. 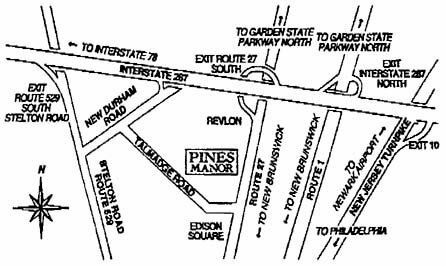 Cross over Route 1 and go to the second traffic light to the intersection of Lincoln Highway - Route 27. Make a right onto Route 27 North. Go up 4 traffic lights and Pines Manor is a half mile on the right. New Jersey Turnpike North to exit 10. Follow signs to 287 North. Follow the Route 27 South-New Brunswick exit. Bear right onto Route 27 South. Pines Manor is a half mile on the right.